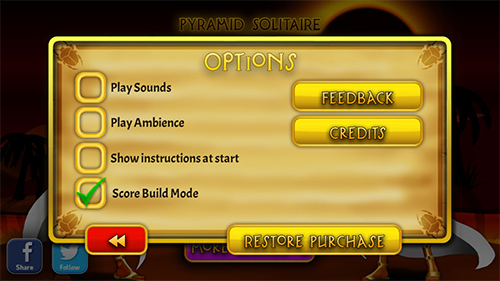 In Solitaire Classic Gold the goal of the game is to move all the cards from the layout to the four foundation piles located at the top of the screen. The game is played with a single pack of cards comprising an A, 1-10, J, Q and K, with Ace playing as low. In order to free hidden cards out of sequence, you can rearrange cards on the Layout. Cards must be ordered from high to low, with the cards alternating between black and red. In the Foundations, the cards must be sorted into their suit piles, from low to high. Use the cards in the deck, which consists of the remaining cards of the pack, to help you make longer sequences and free other cards. A round is won when all 52 cards, including the cards in the deck, end up in the Foundations. For a high score try to win several rounds of Solitaire Classic Gold in one game. Each card placed on the Foundations is worth 500 points. Completing one Foundation pile is worth 5,000 points. Clearing all cards is worth 10,000 points. If you’re stuck in a rut and want to get your score or your time up, here are some handy hints and tips to get that score accumulator ascending! When the game begins, flip the first card in the stock, which will give you more options. Look very carefully at your tableau before you begin making decisions. It’s simple enough to overlook and this time will eliminate hasty decisions. Don’t forget to lay Aces in the foundations, rather than have them sit on their 2s or in the stock. If, for example, you have two black tens and one red jack in the tableau, consider the tactics of potentially freeing up a column quicker or getting rid of more cards. This also means being aware of the ratio of colours you already have in your tableau and immediate stock. There’s no point freeing up a red queen if your cards are all already predominantly red!